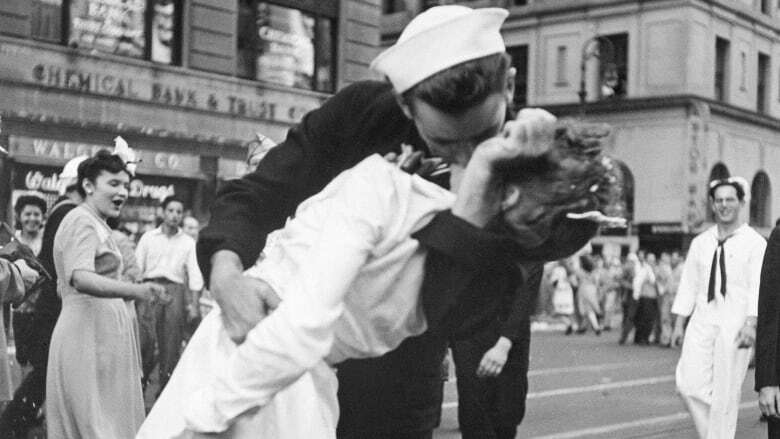 The ecstatic sailor shown kissing a woman in Times Square celebrating the end of the Second World War died Sunday. George Mendonsa was 95. Mendonsa was shown kissing Greta Zimmer Friedman, a dental assistant in a nurse's uniform, on Aug. 14, 1945, known as VJ-Day, the day Japan surrendered to the Allies. People spilled into the New York City streets to celebrate the news. An iconic photo of the kiss by Alfred Eisenstaedt was first published in Life magazine and is called "VJ-Day in Times Square," but is known to most as "The Kiss." When he was honoured at the Rhode Island State House in 2015, Mendonsa spoke about the kiss. He said Friedman reminded him of nurses on a hospital ship, who he saw care for wounded sailors. "I saw what those nurses did that day and now back in Times Square the war ends, a few drinks, so I grabbed the nurse," Mendonsa said, WPRI-TV reported. Friedman fled Austria during the war as a 15-year-old girl. She died in 2016 at 92 at a hospital in Richmond, Va., from complications of old age.